Now available on DVD for just the price of printing the DVD and cover and shipping and handling: Nun wollen wir euch nicht länger warten lassen, fürs neue Jahr haben wir uns etwas ganz besonders ausgedacht, die DVD zu "STARFLEET ACADEMY" der Film gibt es ab sofort Gratis online zu bestellen, es fallen lediglich die Verpackungs- und Versandpauschale an !!!! 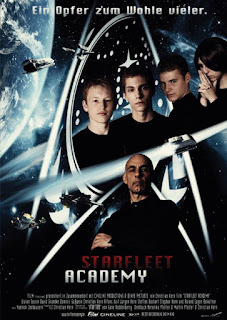 In 18 Tagen ist Weihnachten un ab heute koennt Ihr die DVD zu STARFLEET ACADEMY auf www.starfleetacademy.de bestellen ! Looks like Teen Trek. Costumes are not standard Starfleet Uniforms. You Tube Home: https://www.youtube.com/user/Filmhochzwei Vimeo: http://vimeo.com/user2682528/videos . They have shot a single, 97 minute German language film, which they completed and are showing in theatures, starting in October 2011. If it's a hit, they will consider shooting more. They will put it on the internet eventually, first in German, then with English (and probably other) subtitles. Here is some film about the first public showing of this film: http://www.youtube.com/watch?v=HN90624Fqpc&feature=channel_video_title (12:06).